On the stroke of midnight [last Friday/Saturday night], Boris was fired up ready for the inaugural journey west. Talk about jumping in at the deep end; we hadn't so much as been able to give 'him' a proper road test beforehand such was the urgency on getting to Bude and catching what appeared to be a perfect swell. I had hoped that any waves would arrive a day or so later allowing a more leisurely drive down [post-testing of course! ]; but with it forecast to be gone by end of play Sunday, what options did we really have?! First stop was the all night garage at the Holdingham roundabout to fill up, as I'd only put in 10 litres from a can earlier in the day. With this being a new tank I wasn't expecting any issues but I was keeping a wary eye all the same. To my horror on returning from paying I could see the tell-tale signs underneath that suggested something [still] wasn't right; a puddle of fuel was apparent with a constant drip-drip adding to it! What to do? Rightly or wrongly I made a snap decision to press on, if only to see to what extent the problem went. It was too dark to assess where or how the leak was coming from, but I figured that it had to be something stupidly simple as it wasn't gushing out as had been the case with the original. Thus Ben, Boris and me continued on into the darkness on a journey to the unknown. Progress was good and the miles ticked by steadily with the gauge not unduly worrying me. With a driving time of only around 3.5 hours I decided that Michael Wood Services would be a sensible stop over to rest for a while. Not bad when I compared this with 3 hours in the car. I slipped into the back of the van while Ben stretched out in the front for a well deserved snooze. I was surprised to find on checking the time next to find 5am rapidly approaching, but there was a hint of petrol in the air so the need to restart overtook any urge for an extension to our stay. An hour or so later and we were turning off the M5 and making our way onto the Atlantic Highway. The fuel gauge although not as ever giving an accurate reading did give me enough reason to execute a 'splash&dash' just to make sure nothing silly happened. The drip-drip of fuel was still apparent but as with the MW stop; not overly alarming. I did though borrow a better screwdriver to see if I could affect the flow but without success. The remainder of the journey was uneventful and as we neared our destination and caught our first glimpses of the sea, it became obvious to head straight for Widemouth. We could sort out our pitch later in the day! We were greeted on arrival with the heavenly sight of a perfectly formed and well behaved swell. Any fatigue soon dispersed as we grabbed a quick cereal breakfast, and leapt into the wetties. A little after 9am and we were both in! The paddle out was relatively straightforward with no hindrance along the way, and we were soon out back with a fair few others seeking to get up to speed as quickly as possible. Ben had had one or two short rides by the time I got there, whereas it took me perhaps 10-15 minutes to get my first ride of the day. Nothing spectacular, but enough to get the adrenaline flowing that bit faster though surprisingly I did struggle with consistency for half an hour or so. Enough to make me consider paddling back in and moving the fin back in the box to give me that little extra speed to get into the wave. I didn't in the end; partly because I feared tiredness may creep back into the equation, but mostly because slowly but surely everything did begin to 'click'. 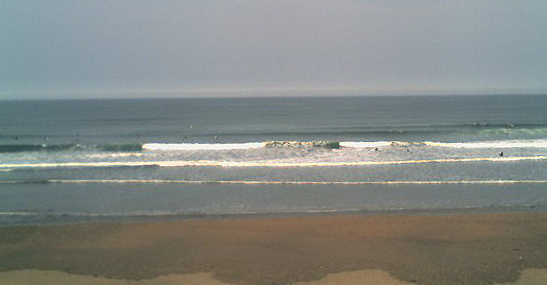 A slight lull around high tide [10am] also aided my progress as this enabled plenty of recovery time between waves. Even so, trading waves with Only Son in the Atlantic once more was as ever rewarding. Watching him from the ideal position [out there with him] pulling into yet another steepening face of a wave and set off on yet another accomplished ride provides all the satisfaction a chap can surely need. We got out after a couple of hours or so, returned to the van, and changed to allow our stuff to dry off in the warm summer-like conditions while we sort lunch. Lounging around in Boris seemed to confirm a feeling of smugness as we contemplated going back in before setting off to Wooda to get a camping spot sorted. As if we wouldn't have got suited back up!? Conditions as the tide dropped weren't as good by the time we ambled back out to the waters edge; the swell had dropped a little and a variable but very slight sea breeze was apparent. But nonetheless, there was still enough for us to play with for another two hours before once again we returned to the van to call it a day surfing wise at least. By now a certain footie match was about to kick off and as we cruised through a deserted Bude and on towards the site, listened to the early stages on the radio. Thoughts though were more towards heading back later into town and to reward our Herculean efforts with some fish and chips from the Mermaid. By the time we did this WR had been sent off and extra time was beckoning. Even so it was far more rewarding sitting on the headland looking out over Summerleaze and wondering in the perfect early evening sunlight whether or not we'd have some swell in the morning. By the time we got back to our pitch on Wooda, the Penalty Shoot Out was underway and the inevitable demise of a nations hopes materialised once again. The beer in the bar later tasted just as good though and was it no surprise we both slept like lambs in the back of Boris that night! Sunday dawned a little later than the day before not unsurprisingly. Even so we were still at Widemouth and suiting up around 9.15. The swell had dropped a foot or so to around the 2' mark, but was still well log-able being fanned as it was by a persistent and warm offshore breeze. Refreshed we paddled out and got straight into the action from the off and for a while the comparisons with that really fun day we had at Sandymouth were obvious. Ultimately it didn't transpire to be as good as in this case the swell was clearly dropping while then it had grown. However that wasn't to detract from our fun. I'd persisted with my fin set up at the back of the box, but did notice that Ben was getting a greater percentage of his attempts in the early stages. This time I did quickly nip back in and switch to a front setting and the effect paid off with more waves caught. After another solid 2 hours in the water and having seen off high tide and the early ebb, hunger pangs kicked in and a lunch break beckoned. We did similar to the day before and got changed, though this time we ventured no further than the food outlet at the beach. The day before we had wandered over to the Beach House to pick up a pasty. The weather though was threatening a change as we queued though in my expert opinion I didn't think it would amount to much more than "catching the edge of a thundery shower". To be fair the sky hadn't looked that gloomy in the lead up to the first distant rumble. However as we settled into the van to nosh these first impressions were soon dismissed with contempt, as Mother Nature unleashed a torrent of rain mixed in with some spectacular pyrotechnics. The benefits of Boris rose in the course of this half hour tropical interlude as we luxuriated in the shelter provided. We noticed too that the wave conditions did seem to be improving and so the balance of thought towards stopping for a second night rather than returning were improving. When the weather had settled again the need to cool off in the sultry conditions further tipped me towards heading back in to make the most of our time here. The wave size was generally smaller than earlier, but the offshore still persisted and so I began to don a soggy rashie, trunks and wettie. They would have been drier, but for the rain! Ben too followed suit [pun not intended!]. To make matters a little more sporting we agreed to switch boards with me trying out his tri fin set up for the first time. Initially I didn't notice anything different in terms of catching a wave...but once you caught it, this was a different matter. Near to the end of the stint, I'd paddled over nearer to the Black Rock end of the beach as I'd spotted a bit of a left peak in front of the bathing area there. One other surfer had also noticed it and in between brief exchanges of chat, I enjoyed what turned out to be a sequence of 3-4 rides that were as sweet as anything you could have wished for. It seemed as if the wave went on for ever and with speed too as I hooked in to a seemingly endless sweet spot before having to pull out before steaming into the bathing area at Widemouth!!! It just had to be those extra fins working. Ben in the meantime had been concentrating his efforts further north along the beach with some success if not as spectacular. Just after 4pm though with conditions now poo-ing out we called a halt to the water time and set off back to base to settle in for the evening before setting off back to Lincs the following morning. The journey back was hot but otherwise uneventful if you can ignore the embarrassment of the filling up with fuel at Barnstaple. We got away from there pretty sharp-ish and pushed on for about three hours until we were south of Brum and only 105+ miles from home. 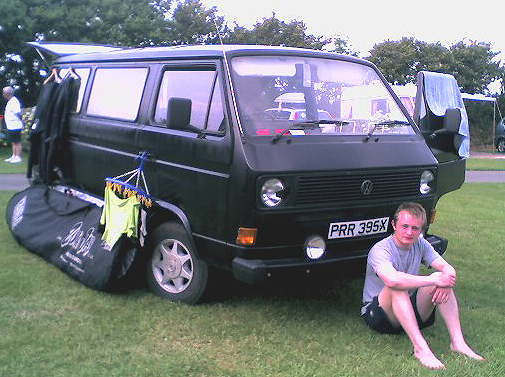 Even so the van had done all that was asked from it and with an average estimated mpg of around 25-27 despite the leak. Expectations are high therefore for when we go down en famillies in 3 weeks time. We can hardly wait.